Earlier this week, federal transportation secretary Ray LaHood announced $1.5 billion worth of grants to assist 51 pending transportation projects in 41 states and the District of Columbia. None will be more visible or symbolic of a new, more sustainable transportation future than the one for a badly needed new train station in New York City. About half the money will go to transit and rail projects, including $83 million to fund the first phase of the long-anticipated “new Penn Station” in Manhattan. The new facility will occupy the city’s huge Farley post office building across Eighth Avenue from the current Penn Station and Madison Square Garden. It will be named for New York’s late Senator Daniel Patrick Moynihan, who championed the project while he was still alive. Moynihan also was the principal author of the landmark 1991 federal transportation legislation that for the first time opened federal transportation funding to community and environmental projects. What a great and fitting tribute to a giant among legislators. And what remarkable evidence of this administration’s much-appreciated commitment to efficient, people-oriented transportation. The group Friends of Moynihan Station hailed the announcement, which completes the funding necessary for Phase One of the project, which will include new entrances to the current, underground Penn Station from the Farley building, major improvements to passenger and visitor concourses, and new escalators, elevators and stairs to the train platforms. Construction can begin late this year. Phase Two will include, among other major improvements, an iconic, open train hall in the Farley Building. 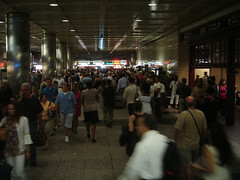 Penn Station is the nation’s busiest transportation facility, handling over 600,000 passengers daily. Those of us who use it, and that includes me when I travel to New York several times each year, know that the current Penn Station leaves a lot to be desired, to put it mildly. Unlike wonderful stations in DC, Philadelphia, Paris, Berlin, and London, just to name a few, Penn station is cramped, claustrophobic, and completely devoid of natural light. While there have been some heroic attempts at improving the place over the last 10-15 years, it is not somewhere you ever want to be if you don’t have to. It doesn’t come remotely close to Grand Central, Manhattan’s iconic station on the East Side. 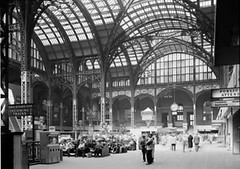 And that’s a shame, because Penn Station once was itself grand and inspiring (see photo of its interior, below). It was demolished to make way for the current facility as a result of a litigated decision that was lost by the old station’s proponents but nonetheless galvanized the preservation movement in New York and elsewhere. When the new project is finished, intercity passengers using Amtrak will be shifted to the Farley building, and local and regional commuters using New Jersey Transit and the Long Island Railroad will be given more space in what is now the current facility. While there is no doubt that the major upgrade to Eighth Avenue will spur additional redevelopment near the new station, the project will focus on its transportation purpose. The New York Times saluted this decision in a recent editorial, noting that given earlier talk of an elaborate mix of major shopping, housing, and sports facilities in the project, its focus – and, given the recession, perhaps even the whole idea – was in danger of being lost. New York’s senior senator Chuck Schumer has been credited with reframing the project to place the emphasis on the station itself, and with helping the project seek stimulus funding. I had the pleasure of hearing Pat Moynihan speak a couple of years before his death, and it was one of the most intellectually impressive speeches by a politician that I have ever heard. I was sitting at a large dinner with a seasoned lobbyist from the National Trust, who leaned over and said, “There will never be another like him.” But now at least there will be a legacy. Principles for a Great New Penn Station from MAS on Vimeo.